Knowledge Management Center at ADB headquarters. Multilateral development banks (MDBs) are rich in knowledge. Among the many different types of knowledge there is operations knowledge, which I define as the knowledge generated from the development projects of MDBs. It can also be called project-level knowledge, including innovative approaches, good practices, lessons learned, and ways to tackle challenges. Operations knowledge can be generated from any phase of a project cycle, and may cover any aspect of a development project. The core mandate of MDBs is to finance development projects in developing countries. In line with this goal, operations knowledge forms the base and backbone of the knowledge resources of MDBs. Operations knowledge—if captured, shared and reused—can greatly improve the design and implementation of future MDB projects. However, despite increased focus on knowledge management, much of MDBs’ operations knowledge is still embedded and fragmented in various project documents, data banks, and in the heads of project officers. MDBs’ portfolio of development projects is like a treasure island, where a wealth of operations knowledge is buried, largely untapped. So how can we systematically capture, share and allow the operations knowledge to flow back for reuse to enhance the development effectiveness of the MDB operations? Firstly, in an earlier study we found that MDB project cycles and knowledge cycles are very different in nature. Basically, project cycle is a hard cycle while knowledge cycle is a relatively soft one. MDB project officers must go through each and every phase of the project cycle to finish a project. In contrast, it is not a mandatory requirement for the project officers to undergo the whole knowledge cycle when managing a project. So for the knowledge generated from old projects to be reused in new projects, more policies and procedures to harden the knowledge cycle need to be put into place. Secondly, knowledge generation and knowledge use are usually done by different individuals or organizational units, and there is a wide gap or long process between them, so knowledge generated cannot be reused automatically without proper intermediation. Knowledge intermediation is the intermediate steps that bridge knowledge generation and use, including knowledge capture/extraction, organization/storage, and sharing/dissemination. For knowledge generated to be eventually reused, further knowledge intermediation measures also need to be taken. Thirdly, the knowledge cycle is intertwined with the MDB project cycle. Knowledge generation usually transpires the later stages of a project cycle. This is when project officers gain tacit knowledge of what works and what doesn’t in practice, through observation and validation. Knowledge use happens mostly during the earlier stages of a project cycle, when knowledge generated from old projects is applied in the design, preparation and implementation of new projects. Better alignment of the knowledge cycle with the project cycle will narrow the dichotomy between the knowledge management and the project management functions of MDBs, and enhance cross-project learning. Note: CPRM = Country portfolio review mission; EVIS = Evaluation information system; IED = Independent Evaluation Department; PCR = Project completion report. Source: ADB task team. 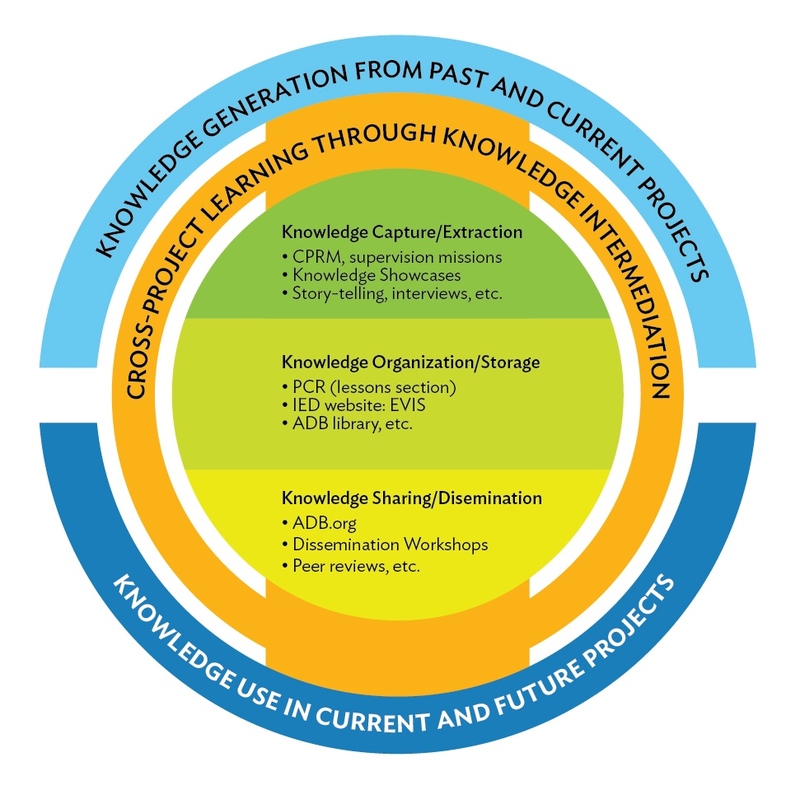 We need to take more concrete measures to harden the knowledge cycle, improve knowledge intermediation, and align the knowledge cycle with the project cycle. For example, awards can help us encourage project officers to write more knowledge products, or peer reviewers to provide high-quality advice. Other ways are to promote cross-department participation in project processing and supervision missions, enhance due diligence by including lessons learned and best practices from broader sources, and develop a system to capture the tacit knowledge from staff leaving MDBs. To facilitate the capture and documentation of operations knowledge, we particularly proposed guidelines, tips, interview questions, and samples knowledge products in the study. We developed a concise template for operations knowledge products, which basically include four logical components: Contexts >> Solutions >> Results >> Lessons. Demonstrative case studies were produced based on the methodology. The capture, sharing and reuse of the operations knowledge is getting more attention from MDBs, development partners, developing countries, and executing and implementing agencies, etc. Later this year, ADB will organize a conference in the People’s Republic of China (PRC) jointly with the World Bank Group, GIZ, USAID, and the PRC Ministry of Finance to discuss tools, processes, and methodologies for capturing and sharing operations knowledge. We are looking forward to exchanging views, and exploring how to further our work in this important area with our knowledge partners collectively.